Synopsis: Pontecorvo’s follow-up to The Battle of Algiers tells a story of imperial intrigue on a fictional Portuguese “sugar and slaves” colony in the Caribbean in the 1840s. 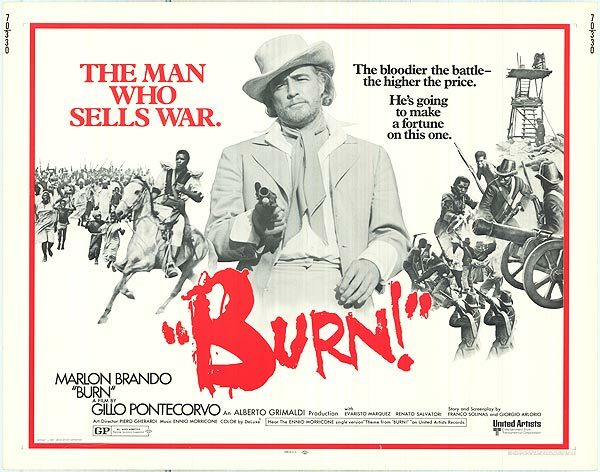 Marlon Brando plays a British agent who helps convince Jose Dolores, one of the island’s many African slaves, to lead a revolt – which temporarily aligns with the local elite and wins independence. However, the African slaves’ economic and social position remains virtually the same under the new regime. Years later, Brando’s character must return as the Africans are now revolting against their new masters. Pontecorvo uses the story as a metaphor less for any one particular historical incident, but as a left-wing commentary on the full history of slavery, empire, neo-colonialism and resistance for the past two centuries.